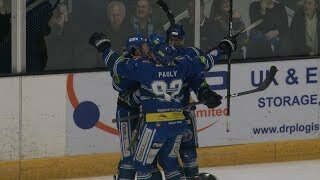 The Genting Casino Coventry Blaze produced a thrilling final 1 minute and 3 seconds to turn a 1-2 deficit into a 4-2 victory against Gothiques d'Amiens. Blaze lined up the same as the night before with Miika Wiikman starting and playing the full 60 minutes between the pipes. Their opponents however did make a change in net with Lucas Savoye getting the start ahead of Henri-Corentin Buysse who was so impressive in the first game. It was a physical opening period that passed by without either netminder being beaten. 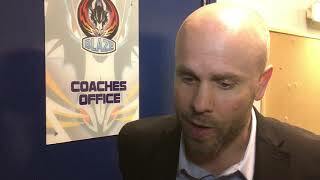 The second period began as a carbon copy of the night previous with Amiens making Blaze pay for early mistakes scoring twice within the first three minutes. Following a time-out, Coventry raised their physicality level, leading to an opener from Man of the Match Luke Ferrara, the Brit hitting home a rebound for 1-2 before the half way mark. As the clock ticked down it looked like the visitors were going to grab their second victory from the Skydome, but a late turnaround came from the Blaze. Ben Lake with just over a minute remaining tied the game at two, before Captain Kevin Morris grabbed the game winner just seconds later. Defenceman Justin Hache, opened his account for the club by scoring into the empty net for a final score of 4-2. Blaze will now round-off their pre-season campaign away from home against Milton Keynes Lightning on Wednesday night.